It seems that the new craze in healthy living is Tea detoxes aka Teatox! I've always been curious to see how these work and if they actually produce any results. 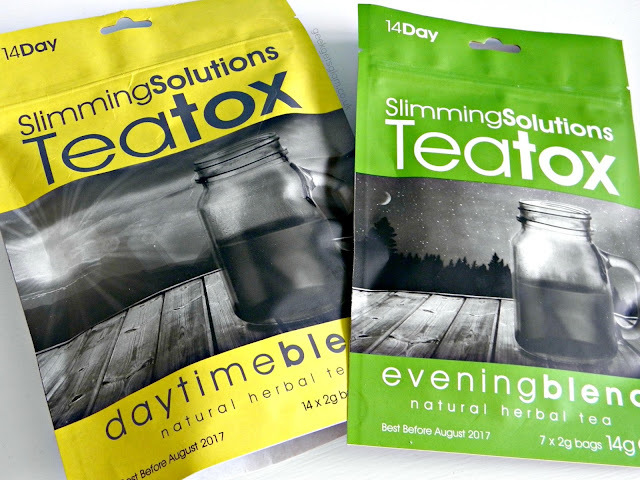 In my head I was certain that there was no possible way that a cup of tea could do anything at all to my weight or well being so when I was asked if I would try out the Teatox from Slimming Solutions, I decided to give it a go! Slimming Solutions' Teatox is supposed to remove toxins and burn fat. They advise that alongside using the Teatox, you follow a clean diet plan which is available on their website. I had a look on their website and couldn't find the recipe plans anywhere except for some you can buy on top of purchasing the Teatox cleanse. If you don't fancy buying these, there are lots of clean eating ideas on Pinterest. The instructions for Teatox are simple: Every morning you have a cup of the Daytime blend as soon as you wake up, and every other evening you have a cup of the Evening blend for two weeks. Easy peasy! I have to admit I was dreading drinking these teas after not liking the smell of them. The Daytime blend smell is quite lemony but also it's kind of herb smelling too. Once I brewed it, and let it cool to drink it, I was pleasantly surprised. It tastes like a combination of Earl Grey tea and Green tea - sounds weird but it's very easy on the pallet and I enjoyed the taste despite hating the smell! Immediately after drinking the Daytime blend yo can feel some of the effects. I kept burping (sorry - TMI) which is unusual for me and I felt a lot less bloated than I normally do in the morning. The Evening blend was a little more tricky. I didn't like the taste as much because this one was much more herbal but I started adding a chunk of lemon in it which made it much nicer! Because you drink the Evening blend every other night it was hard to keep track and I had to set a reminder on my phone! After the two weeks of Teatox I physically felt much better. My skin looked healthier and I was less bloated and a couple of people commented asking if I'd lost weight! The unfortunate part - I hadn't really made a significant drop in weight, it was just an illusion because of how bloated I must have been before! Having said that, I did feel so much fresher and alert after drinking these teas. And anything that gets rid of my horrendous bloating gets a thumbs up from me! The Teatox isn't a miracle product and you really have to incorporate it into a healthy diet with a good exercise regime in order to lose a significant amount of weight. Slimming Solutions are pretty upfront about this aspect whereas other tea detox style drinks I've seen practically guarantee you'll lose weight off the tea alone and that would be impossible. Teatox is for those of you who want to reduce the bloat and have a detoxing drink to supplement a healthy diet. I was worried I'd hate the taste but if you like herbal or fruit tea, you'll be able to drink and enjoy this. I'd like to try this detox again when I find a nice and healthy clean eating diet to see if it could help me lose some extra pounds! The teatox I did tasted vile so this sounds better. I agree it's more for bloating and assisting a healthy lifestyle rather than an easy solution. Great review! !